like Christmas every day: You can order until 1/27/11!!! You can order until 1/27/11!!! Isn't this just gorgeous? 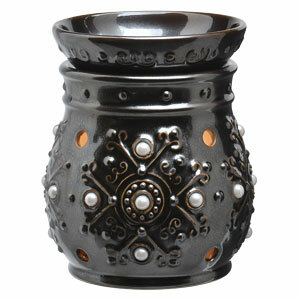 The Margot full-sized warmer from Scentsy. Well, by now I hope all of you have ordered from Scentsy and know how wonderful their scents and warmers are. My party is going great! I am only about $100.00 from getting 15% in free products. If you could help me out that would be great. If not, I totally understand. I know money is tight all over. But if you have a warmer and could buy a Scentsy Bar for just $5.00 it would still help. Click on this link to access my online party! When you place an order on-line it credits my party. So it doesn't matter where you live, just put in your shipping address and the products come right to your home. That's the cool thing about Scentsy parties. Even though we are miles and states apart, we can still have an online party! Isn't that cool? I love my Scentsy warmer, and Mochadoodle is my favorite scent. When my warmer is on, it fills up my whole office (over 3000 sq. ft.) with this wonderful mocha coffee scent. The best part is they are flame-less, perfect for the office environment. Scentsy did not pay or compensate me in anyway for this endorsement. I am having a "basket party" and am participating in selling through that party.